When it comes to increasing brand recognition and expanding your online audience, Facebook is an unparalleled social media marketing platform. 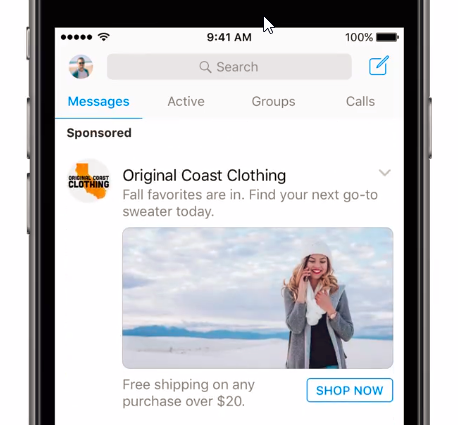 The network previously offered ad placements on Facebook, Instagram, and their “Audience Network.” Now, the company has added a new and powerful advertising feature into the mix: allowing businesses to place ads on Facebook Messenger. After successful tests in Australia and Thailand, Messenger Ads will soon be available to all advertisers across the globe. The goal of the rollout is to help businesses increase both customer satisfaction and brand awareness when marketing on Facebook. Users still will be able to hide or report ads they don’t wish to see, while marketers will be able to reach current and potential customers more easily. The decision to show advertisements in Messenger marks a shift in Facebook’s monetization approach. Originally, the social media network wanted to persuade brands to move their customer service departments to Facebook. The company would then provide automated chat bots that would answer customers’ questions and even assist with completing the sale. These bots are similar to those already available on several e-commerce sites; however, the technology wasn’t as immediately popular as the company had hoped. Facebook’s mobile payment app, which was added to Messenger in 2015, also didn’t perform as well as the company had expected. Many analysts suspect that this new rollout of Messenger Ads is a sign that the company needed to re-evaluate its monetization efforts. Choosing to display targeted marketing ads in Messenger also allows Facebook to meet the expectations of those who utilize its ever-growing platform, Facebook for Business. Previously, Facebook may have been close to reaching the limit of how many ads it could show in the News Feed, which could in the long run decrease the company’s revenue growth. With another advertising option available, Facebook should be able to address this issue. 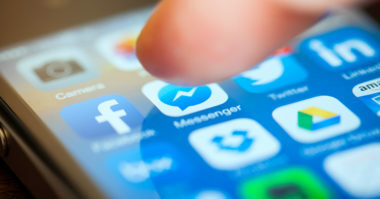 Facebook Messenger, a standalone texting app supporting images and video, branched off from being a part of the main Facebook application in 2014. Today, Messenger continues to grow, with many users choosing the service as their primary method of communication. By allowing businesses to place ads on Messenger, Facebook has given advertisers an opportunity to boost their social media marketing reach and increase conversions. You may be wondering how this new rollout will affect your target audience. So, how does this new feature work? Essentially, those using Messenger will view a list of advertisements among their list of friends. The ads will not appear inside the messages themselves, allowing users to chat without interruption. Facebook has been committed to keeping the user experience free of interruptions, which they know could be a source of annoyance for users. While most users are accustomed to seeing advertisements in their News Feed, they may not be used to viewing ads when using Messenger. Fortunately, as an alternative to traditional ads, Messenger bots allow marketers to drive News Feed ads to a live chat, which enables your company to personally interact with customers. With engaging calls-to-action, brands will be able to increase interaction with potential leads. When users click on your call-to-action, they’ll see an open Messenger window that displays your ad or a specific message. You’ll also be able to send users to a destination of your choice, such as your website or a specific landing page. Creativity is important when it comes to attracting customers, so consulting with a reputable social media marketing agency may be a good option for those who need assistance crafting their message. Sponsored messages also will be a part of the new Facebook marketing tool. When customers have contacted your business in the past, they may be open to a new conversation. With sponsored messages, you can send a custom-tailored greeting to the customer, giving them an opportunity to re-engage with your business. Facebook’s new Messenger Ads feature is not just for large corporations—businesses of every size can grow their audiences with this service. Whether your business is small or large, using best practices when marketing on Facebook is key. When incorporating Messenger Ads into your social media marketing strategy, it’s important to note that there are two types. The first type of ad uses Facebook Messenger as a destination. As previously mentioned, destination ads appear in the user’s list of friends and open a specific destination when clicked on. Facebook has provided several options for customizing your ads—advertisers can add videos, images, or even create a slideshow. One of the primary purposes of destination ads will be to re-target your message. These ads can reach out to those who have visited your website before, but didn’t complete the sales journey. Most of the time, there’s a reason the customer didn’t commit to a purchase. Using Messenger gives customers a chance to ask questions and eliminate their doubts, increasing the chance of a sale. In addition to targeting people who are familiar with your brand, destination Messenger Ads can be sent to those who have never interacted with your company. The ability to reach out to “cold traffic” is important, but it must be done right to raise brand awareness. Use the ads to prompt a great sales conversation; one way to do this is by asking a question that your audience can relate to. The second type of Messenger ad serves as a placement ad. This involves creating sponsored messages, which appear inside the user’s inbox instead of in the list of friends. For the user, it’s just like receiving a message from a friend, only it’s from a brand instead. This type of ad placement is best for brands that wish to increase website conversions or want to take the conversation to another destination, such as their website. When sending messages directly to potential customers, there is one important point to consider: these messages can be sent only to those who have previously messaged your page. Companies cannot reach cold traffic using this type of message. Facebook Messenger Ads give your brand an opportunity to further engage with your target market. If you’re wondering how your company can grow its business by using Messenger ads, consulting with an experienced social media marketing agency is a great way to get started. Choosing an agency gives you access to a wealth of expertise, and with your social media needs covered, you’ll be able to focus on other tasks. Marketing agencies can craft custom messages, schedule engaging posts, and create ads that will help your business achieve its goals. Will your business take advantage of Facebook Messenger for marketing? As the rollout begins, only time will reveal whether this new monetization effort is successful. Stay up to date on the latest in Facebook advertising. Contact MDG Advertising today at 561-338-7797 or visit mdgadvertising.com.